Sequential Remarketing: What It Is & How To Make It Delightful - Take Some Risk Inc.
I’m going to show you how to build the last remarketing campaign you are ever going to need. Brands often don’t do remarketing or miss out on the basics. Today I’m going to talk about sequential remarketing and the steps you need to take to build out a delightful experience for your customers and potential customers. Today I want to talk about Sequential Remarketing – what it is and how to make it a more delightful experience. It takes some work and is totally worth it. Delightful remarketing is about connecting with visitors to your website who may not have made an immediate purchase. You do this by targeting ads in front of a defined audience that had previously visited your website. This can help a brand grow their revenue & profit AND not piss off customers in the process, which isn’t mutually exclusive. It just requires more effort from each of us. Over 60% of customers abandon a shopping cart each year…think about that for a second? That’s a lot of people leaving your website and never coming back. This leaves open a massive opportunity because we have 1 billion people coming online by 2020. If your remarking isn’t on point and superior to your competitors, you’re going to get left behind. Plus many of those 1 billion people will be on a mobile device. PERIOD. They won’t own a desktop computer because for many people in the BRIC countries, they can’t afford one. That means even more people abandoning their shopping cart and not buying from you. Is your company ready for the next billion? Typically when you hear people talk about remarketing, it’s doing remarketing 101. This could be people abandoning their shopping cart or remarketing to people who visited one of your key pages like the pricing, features or contact us page on your site. Those are all great remarketing lists and campaigns to setup and run. However, let’s take our remarketing to the next level…ok? 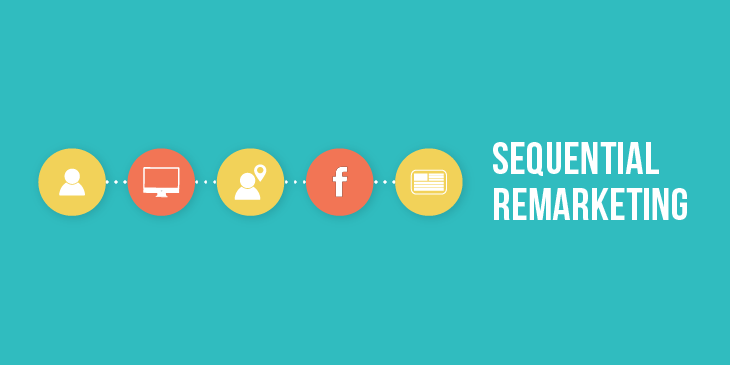 Sequential remarketing is story based remarketing. You take your customers on a journey as they click on an ad, visit a landing page and then take an action. You start to show them the next act in your story as you move people through a funnel. You see a lot of people do funnel marketing on Facebook. However, we don’t see as much people do the same on paid search; whether that is Google Ads or Bing. Lets say you are about to launch a new business that includes a bamboo clothing line for men. Since no one knows about the brand and you are going to want to take customers on a journey to get them excited about your brand and mission. You might start off with video marketing on YouTube and build a remarketing list of people who was more than 50% of your mission video. The video could talk about how you give money to NGOs that help preserve the rainforest in Canada and around the world. For those that watched the video, you might want to serve them an ad that leads to a landing page about your bamboo clothes. The landing page talks about why they are more comfortable to wear and what makes bamboo a breathable fabric. For those that didn’t watch the video past 50%, you could serve them a different video featuring people who test wore your clothes during a trial run. After running people through 2 or 3 steps in your story arc, you would have a strong list of people who are more familiar with your brand and are in a position to buy. You could serve them a mix of ads on Google (RLSA, Display, video) and Facebook featuring your launch product. If your product still haven’t launched, you could take pre-orders for the brand. Here are things to keep in mind when you’re launching any campaigns, regardless of the industry you’re in or what you’re selling. Cap at 2 – 3/day. You don’t want to have your customers get brand fatigued. Remarketing is a marathon not a sprint. It’s a gentle reminder not a bash over the head. If you don’t know… dig into Google Analytics and test to find out what works for your brand. If you’re on Google Ads or a platform that lets you segment by age, do it. You can waste a lot of impressions and spend by targeting people who aren’t going to convert on your product. At my last couple startups, it has generally been 25 – 44 year olds that converted the most. Why target the whole country…. why not look at major cities or certain states for each country. Limited the locations you target, can save you time and money as you don’t have to worry about targeting people who have no interest in your product… or are less likely to convert. Look at GA or your analytics package to see what markets you’re strong in. Marketing is like a game of Risk, you want to own your territories and fend off competitors. Use location targeting to your advantage. Most platforms default to 30 days. Unless you’re in an industry with a long sales window; mortgages, cars or industrial equipment. Keep your look back window to 30 days or less. Very few people will convert after seeing your ads for 30 days. Plus after 30 days, it’s just annoying to see ads for a brand you may not care about. Use a variety of creative. Having a set of pure brand creative is fine, but make sure to mix it up with other creative that goes super niche. 10 remarketing lists of 100 people with great creative is always superior to one remarking list of 1000 people and generic creative. Keep message match in mind. The way to find ad copy for your remarking is by interviewing customers and talking with CS team. If your homepage is not answering their questions and helping the customer, that’s a golden opportunity to put it in your remarketing. That is it for this week. See you next time.